From the Baldwin County Courthouse, go east on Hwy 22 (Sparta Hwy) for 6.8 miles to 715 Sparta Hwy NE (on the right side). The graves are located 500 feet to the southwest behind the house. The cemetery is directly behind 711 Sparta Hwy. Located on Baldwin County tax map #108-073. Gravestone reads 1876, but a will he signed is dated 1878. All info and gravestone installed by Eileen Babb McAdams. Death date 1899-1900, dates per Confederate pension records. 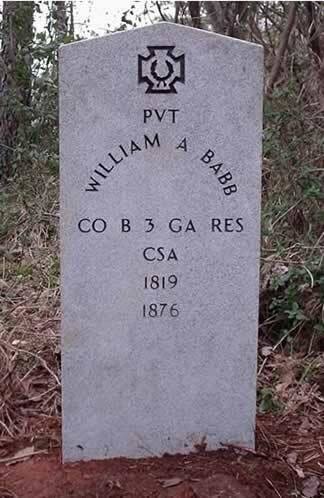 W/o William A. Babb. Info per Eileen Babb McAdams.